The MAKE UP FOREVER HD Microperfecting Primer was reviewed on a popular Taiwanese variety show that invites makeup artists to share beauty and makeup tips with artistes. When the makeup artist applied it on one of the invited guests, her skin instantly went from dull to bright right after applying the Make Up For Ever – HD microperfecting primer #5. I would have glistening skin and my face would be so smooth flies could slide down. All my skin woes would be over and I could finally live happily ever after. I contemplated for a while because at S$68 a bottle at Sephora Singapore, it was waaaaay out of my budget for a foundation face primer. So I got my friend who was coming back from the US to get it for me. U$32 ~ S$44.80. YAY! Big savings! There are six color-correcting shades and 1 transparent (Neutral). I got #5, the blue one. A lightweight, oil-free complexion corrector that enhances the skin’s texture and primes the skin for makeup application. So are these claims for real? – Oil-free: Not ideal for oily skin like mine because it doesn’t really mattify the skin, IMO. But still much, much, much better than the Stila Hydrating Primer. Everything is! – Nourishes: Not seen, not felt? – Moisturizes: It does a little bit of moisturizing. And probably a little bit is still too much for my oily skin? – Glow effect: Probably a teeny tiny little but after I apply my MAC Studio Fix Foundation, which gives a matte finish over it, all that glow would be buried under. The glow stuff would probably work if I just have nothing else on except the Make Up For Ever – HD Microperfecting Primer. But who would shell out so much for a primer to work like a moisturizer?! Can you guess which hand has the primer? It’s not obvious from the picture but when I tried it on at Sephora, my hand really did brighten up! The smell and packaging! Even though it looks like a stuck-up sophisticated career woman in its frosty exterior and no-nonsense black cap, it has the scent of a sweet young girl. Like not a girl, not yet a woman. It does the fundamental job of priming the skin for face makeup application. I would recommend this product to those who need complexion correctors (especially to minimize redness on the face) and have somewhat drier skin, but if you don’t, a cheap and good primer would do. 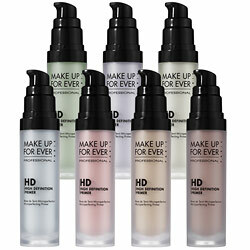 Would you try the Make Up For Ever – HD Microperfecting Primers? Great review! Unfortunately for me the MUFE green primer didin’t worked that well:( I was quite dissapointed, seemed like such a great product at first!